5 Bedroom Detached House For Sale in Chichester for Guide Price £1,500,000. 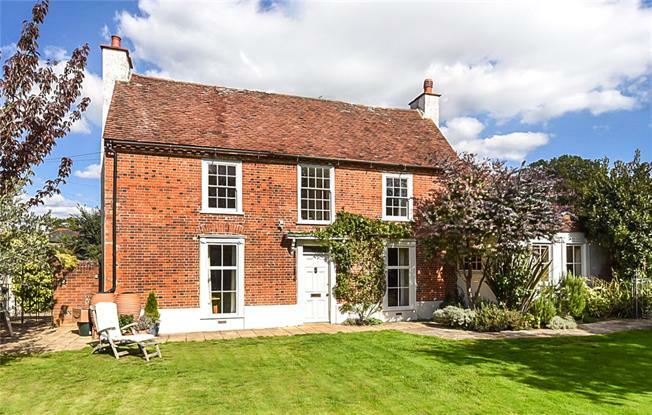 Critchfield House is a charming detached period house believed to date to the 17th Century (though not listed) being located within the heart of this lovely historic village at the top of Chichester Harbour, a designated Area of Outstanding Natural Beauty. The property is beautifully presented throughout with much of its period charm and features still in evidence. To the ground floor are 3 well appointed reception rooms, a hand fitted kitchen/breakfast room with gas Aga and utility room. Also located on the ground floor is a bedroom and en suite shower room benefiting from a separate entrance into a small hallway (with stairs to a further bedroom and en suite shower room) this gives the versatility of this area of the house being utilised as an annexe or additional accommodation to the main house. To the first floor are the master bedroom with an en suite bath/shower room, 3 further bedrooms (one with an en suite shower room) and family bathroom. The second floor boasts 2 further attic rooms. has served as a vicarage and a Hotel and B&B but for the past 16 years has been wonderful family home. The property is located in the heart of the ancient and picturesque village of Old Bosham. Bosham set on the upper reaches of Chichester Harbour, an area of outstanding natural beauty, offers a wonderful sailing centre with a thriving Sailing Club, with 2 public houses, The Millstream Hotel and Restaurant and a local Coop on the outskirts of the village. There is easy access to Havant & Emsworth and the historic City of Chichester with its wide variety of cultural, leisure and shopping facilities, including the renowned Festival Theatre, Cathedral, galleries, museums and restaurants. Leisure pursuits within the area include sailing around Chichester Harbour and horse riding and walking in the South Downs National Park. Horse racing and Motor events can be enjoyed at the world famous Goodwood Estate. Bosham station links to the main line stations at Chichester and Havant providing services along the coast and up to London. Carp pond and patio area. At the rear of the house is an attractive courtyard style sun terrace with pedestrian access to Bosham Lane.